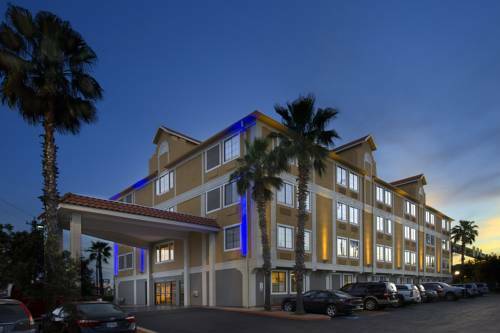 Newly Renovated All-Suite San Antonio Hotel The Holiday Inn Express San Antonio Downtown Market Area is centrally located in Downtown San Antonio. We treat you to modern amenities and refreshing all-suite accommodations with easy access to the Riverwalk and the Market Sq.As one of the top San Antonio hotels near the Alamo and the famous River Walk, fun-filled vacations are our specialty. Make a day of it exploring the scenic sights of downtown, or visit popular San Antonio attractions such as the San Antonio Zoo, Six Flags Fiesta Texas, and UNESCO World Heritage San Antonio Missions Sites. Sports fans browsing hotels near the Alamodome and AT&T Center will love us too.Find big fun in San Antonio and big comfort at our San Antonio River Walk hotel. Our spacious suites exude the convenience of home. Take advantage of free Wi-Fi, spacious work desk, Kureig Coffee machine, and a 42" flat screen TV. After a restful night, our free and fresh Express Start Breakfast Bar kick-starts your morning. Done for the day? Unwind with a relaxing dip in our outdoor pool.Business travelers appreciate our prime location close to Tesoro, Xerox, Washington Mutual, IBC, Toyota, SBC and others. Be sure to utilize the 24-hour business center for any last minute needs. Don't miss our San Antonio hotel deals for an always affordable stay.Experience "suite" satisfaction Holiday Inn Express San Antonio Downtown Market. Enjoy prime steak and fresh seafood in a fine dining atmosphere surrounded by astonishing architecture dating back to the 1800's. Enjoy delicious hamburgers and loaded fries at this downtown San Antonio restaurant. Enjoy an exceptional steak dinner while visiting downtown San Antonio near the Riverwalk. Enjoy this seafood Bistro located right on the Riverwalk or arrange to have dinner on one of their special river barges. Enjoy great American cuisine and rock and roll artifacts situated along the city's famous Riverwalk. So this is your first time in Texas and you haven't seen a cowboy or a horse? Well pardner this is your lucky day! Stop by the Buckhorn Saloon, belly up to the bar for a root beer. Then take the tour of the famous collection of wild animals and oddities.